i am really, really good at losing 30 pounds. but only in between bouts of my true talent: gaining 30 pounds. once again, i’ve hit that critical mass that spurs me to horror and a rueful determination to change my ways. but, a lot has changed since the last time i was in weight loss mode and i have some things to figure out. the most impactful: we moved. i used to live a five minute walk away from a gold’s gym, where i logged most of my running hours on the treadmill. 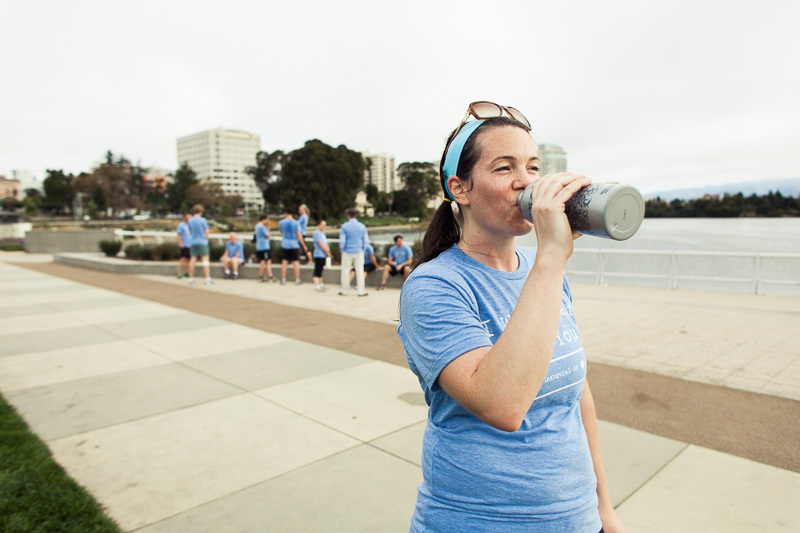 on the weekends, i ran the 3.2 mile path around lake merritt. but we moved to a new house and got married, all in the same month, so my workout habit fell apart in july of last year, as wedding plans ramped up. we did a friends+family 5k run around the lake the morning of our wedding, and that was the first time i had done any running in a long time. and the last. after the wedding, i spent some time just generally slacking off and being relieved to be human again. some time turned into a few months and then i sprained my ankle pretty badly at the end of october. any working out that i had been doing came to a complete stand still. my weight watchers membership fee mocked me every month. as is my way, the lack of exercise led to terrible/wonderful gluttony in my eating habits and the fatness just kept coming. my tolerance for out-fatting 98% of my wardrobe stretched a bit too thin, and here we are. but no gold’s gym and no lake. so i’ve been taking classes at a spinning studio (that is close by, but i have to drive to). it’s too pricey to do all the time, but is probably a good twice a week option. there’s a boot camp kind of thing super close by, and i’m signed up to try that out for a month, with a groupon. i should try to get back into some running, but i’m scared. scared of all the progress lost and how hard it will be. and just dragging my feet on the idea of running without the convenience of a park and foot path. but the bits that i am doing are helping me feel motivated to do more and are inspiring my eating habits. which all means that i’m back to thinking and doing a lot about food and exercise and that means that it’s bubbling up here, too. Tagged as "weight loss" "weight gain"
I haven’t exercised much in the past year (since we moved May 2013). Pretty much my only exercise has been walking 3 miles 4-5 days a week…walking Mack to school with Chewie, so very leisurely pace. However, I am pretty dang thin (for me) right now. I am 9 months NSNG (no sugar, no grains) and love it. Weight just seems to miraculously disappear and I don’t count anything or limit anything (except sugar and grains). I do need to get back to some actual exercise, however. My poor bikes are dusty. You need to write more about it! I miss you! How can we be friends if we don’t blog-talk at each other! you can do it, girl! and running stinks for the first few weeks getting back into it, but then you’ll feel fantastic. you are awesome no matter what!